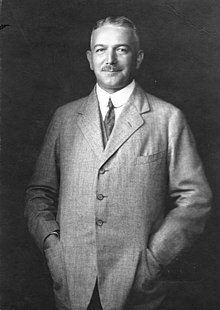 Konstantin Hermann Karl Freiherr von Neurath (2 February 1873 – 14 August 1956) was a German diplomat remembered mostly for having served as Foreign minister of Germany between 1932 and 1938. Holding this post in the early years of Adolf Hitler's regime, Neurath was regarded as playing a key role in the foreign policy pursuits of the Nazi dictator in undermining the Treaty of Versailles and territorial expansion in the prelude to World War II, although he was often averse to Hitler's aims tactically if not necessarily ideologically. This aversion eventually induced Hitler to replace Neurath with the more compliant and fervent Nazi Joachim von Ribbentrop. Neurath served as "Reichsprotektor of Bohemia and Moravia" between 1939 and 1943, though his authority was only nominal after September 1941. He was tried as a major war criminal in Nuremberg and sentenced to fifteen years' imprisonment for his compliance and actions in the Nazi regime. Neurath was born at the manor of Kleinglattbach (since 1972 part of Vaihingen an der Enz) in Württemberg, the scion of a Swabian dynasty of Freiherren. His grandfather Constantin Franz von Neurath had served as Foreign Minister under King Charles I of Württemberg (reigned 1864–1891); his father Konstantin Sebastian von Neurath (died 1912) had been a Free Conservative member of the German Reichstag parliament and Chamberlain of King William II of Württemberg. He studied law in Tübingen and in Berlin. After graduating in 1897 he initially joined a local law firm in his home town. In 1901 he entered into civil service and worked for the Foreign Office in Berlin. In 1903 he was assigned to the German embassy in London, at first as Vice-Consul and from 1909 as Legationsrat (legation counsel). Following the visit of the Prince of Wales to the Kingdom of Württemberg in 1904, as Lord Chamberlain to King William II, he was created an Honorary Knight Grand Cross of the Royal Victorian Order. Neurath's career was decisively advanced by Secretary of State Alfred von Kiderlen-Waechter. In 1914 he was sent to the embassy in Constantinople. On 30 May 1901 Neurath married Marie Auguste Moser von Filseck (1875–1960) in Stuttgart. His son Konstantin was born in 1902, followed by his daughter Winifred in 1904. During World War I he served as an officer with an infantry regiment until 1916 when he was badly wounded. In December 1914 he was awarded the Iron Cross. He returned to the German diplomatic service in the Ottoman Empire (1914–1916), where he witnessed the Armenian Genocide. In 1917 he temporarily quit the diplomatic service to succeed his uncle Julius von Soden as head of the royal Württemberg government. In 1919 Neurath with approval by president Friedrich Ebert returned to diplomacy, joining the embassy in Copenhagen as Minister to Denmark. From 1921 until 1930 he was the ambassador to Rome; he was not overly impressed with Italian Fascism. After the death of Gustav Stresemann in 1929, he was already considered for the post of Foreign Minister in the cabinet of Chancellor Hermann Müller by president Paul von Hindenburg, but his appointment failed due to the objections raised by the governing parties. In 1930 he returned to head the embassy in London. Neurath was recalled to Germany in 1932 and became Minister of Foreign Affairs in the "Cabinet of Barons" under Chancellor Franz von Papen in June. He continued to hold that position under Chancellor Kurt von Schleicher and then under Adolf Hitler from the Machtergreifung on 30 January 1933. During the early days of Hitler's rule, Neurath lent an aura of respectability to Hitler's expansionist foreign policy. In May 1933, the American chargé d'affaires reported that "Baron von Neurath has shown such a remarkable capacity for submitting to what in normal times could only be considered as affronts and indignities on the part of the Nazis, that it is still quite a possibility that the latter should be content to have him remain as a figurehead for some time yet". He was involved in the German withdrawal from the League of Nations in 1933, the negotiations of the Anglo-German Naval Accord (1935) and the remilitarization of the Rhineland. In 1937, Neurath joined the Nazi Party. He was awarded the Golden Party Badge and was given the honorary rank of a Gruppenführer in the SS—equivalent in Wehrmacht rank to a lieutenant general. On 5 November 1937, the conference between the Reich's top military-foreign policy leadership and Hitler recorded in the so-called Hossbach Memorandum occurred. At the conference, Hitler stated that it was the time for war, or, more accurately, wars, as what Hitler envisioned were a series of localized wars in Central and Eastern Europe in the near future. Hitler argued that because these wars were necessary to provide Germany with Lebensraum, autarky and the arms race with France and Britain made it imperative to act before the Western powers developed an insurmountable lead in the arms race. He further declared that Germany must be ready for war as early as 1938, and at the latest by 1943. Of those invited to the conference, objections arose from Neurath, Blomberg and the Army Commander in Chief, General Werner von Fritsch. They all believed that any German aggression in Eastern Europe was bound to trigger a war with France because of the French alliance system in Eastern Europe, the so-called cordon sanitaire. They further believed that if a Franco-German war broke out, it would quickly escalate to a European war, since Britain would almost certainly intervene rather than risk the prospect of France's defeat. Moreover, they contended that Hitler's assumption that Britain and France would just ignore the projected wars because they had started their re-armament later than Germany was flawed. The opposition expressed by Fritsch, Blomberg and Neurath was concerned entirely with the assessment that Germany could not start a war in the heart of Europe without Anglo-French involvement, and that more time was needed to rearm. However, they did not express any moral opposition to aggression or disagreement with Hitler's basic idea of annexing Austria or Czechoslovakia. In response to the reservations expressed at the Hossbach conference, Hitler tightened his control of the military-foreign policy making apparatus by removing those who were out of touch with his policy. On 4 February 1938, Neurath was sacked as Foreign Minister in the course of the Blomberg–Fritsch Affair. He felt his office was marginalised and was not in favour of Hitler's aggressive war plans because he felt Germany needed more time to rearm, which were detailed in the Hossbach Memorandum of 5 November 1937. He was succeeded by Joachim von Ribbentrop, but remained in government as a minister without portfolio to allay the concerns that his removal would have caused internationally. He was also named as president of the "Privy Cabinet Council", a purported super-cabinet to advise Hitler on foreign affairs. On paper, it appeared that Neurath had been promoted. However, this body only existed on paper; Hermann Göring subsequently testified that it never met, "not for a minute." 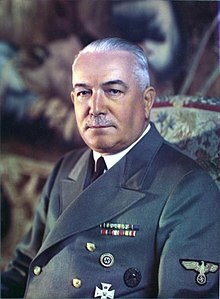 In March 1939, Neurath was appointed Reichsprotektor of occupied Bohemia and Moravia, serving as Hitler's personal representative in the protectorate. Hitler chose Neurath in part to pacify the international outrage over the German occupation of Czechoslovakia. Soon after his arrival at Prague Castle, Neurath instituted harsh press censorship and banned political parties and trade unions. He ordered a harsh crackdown on protesting students in October and November 1939 (1,200 student protesters went to concentration camps and nine were executed). He also supervised the persecution of Jews according to the Nuremberg Laws. Draconian as these measures were, Neurath's rule overall was fairly mild by Nazi standards. Notably, he tried to restrain the excesses of his police chief, Karl Hermann Frank. However, in September 1941, Hitler decided that Neurath's rule was too lenient, and stripped him of his day-to-day powers. Reinhard Heydrich was named as his deputy, but in truth held the real power. Heydrich was assassinated in 1942 and succeeded by Kurt Daluege. Neurath officially remained as Reichsprotektor through this time. He tried to resign in 1941, but his resignation was not accepted until August 1943, when he was succeeded by the former Minister of the Interior Wilhelm Frick. In June of that year he had been raised to the rank of an SS-Obergruppenführer—equivalent to a three-star general. Late in the war, Neurath had contacts with the German resistance. The Allies of World War II prosecuted Neurath at the Nuremberg Trials in 1946. Otto von Lüdinghausen appeared for his defence. The prosecution accused him of "conspiracy to commit crimes against peace; planning, initiating and waging wars of aggression; war crimes and crimes against humanity". Neurath's chief defence strategy was predicated on the fact that his successor and fellow defendant, Ribbentrop, was more culpable for the atrocities committed in the Nazi state. The International Military Tribunal acknowledged that Neurath's crimes against humanity were mostly conducted during his short tenure as nominal Protector of Bohemia and Moravia, especially in quelling Czech resistance and the summary execution of several university students. The tribunal came to the consensus that Neurath, though a willing and active participant in war crimes, held no such prominent position during the height of the Third Reich's tyranny and was therefore only a minor adherent to the atrocities committed. He was found guilty by the Allied powers on all four counts and was sentenced to fifteen years' imprisonment. Neurath was held as a war criminal in Spandau Prison until November 1954, when he was released in the wake of the Paris Conference, officially due to his ill health, as he had suffered a heart attack. He retired to his family's estates in Enzweihingen, where he died two years later, aged 83. ^ "No. 27675". The London Gazette. 10 May 1904. p. 2999. ^ Weinberg, Gerhard The Foreign Policy of Hitler's Germany Diplomatic Revolution in Europe 1933–36, Chicago: University of Chicago Press, 1970, page 36. ^ Weinberg, Gerhard The Foreign Policy of Hitler's Germany Starting World War II pages 39-40. Craig, Gordon "The German Foreign Office from Neurath to Ribbentrop" pages 406–436 from The Diplomats 1919–39 edited by Gordon A. Craig and Felix Gilbert, Princeton: Princeton University Press, 1953. Heineman, John Louis Hitler's First Foreign Minister : Konstantin Freiherr von Neurath, Diplomat and Statesman, Berkeley : University of California Press, 1979 ISBN 0-520-03442-2. Wikimedia Commons has media related to Konstantin von Neurath.